14. Have breakfast at Home Sweet Home | One year, one job. Pouring your own maple syrup = THE DREAM. I am currently laying in bed after my morning trip to Home Sweet Home for a late breakfast. Not because the food was bad, but because the food was good. So good, in fact, that I undeniably consumed far too much of it. As we entered the cutesy Northern Quarter cafe Lucy and I were told to pick a table a browse the menu. I took a prime people watching seat (the NQ is surely the best people watching area in the city, no?) and faced some tough decisions with a side of hipsters. I’d narrowed it down to three milkshake options when the waitress came over. I asked for her preference and settled for a banana, chocolate and malt concoction. As the waitress walked away to process our order (Lucy had option for a far more acceptable Flat White) I noticed something else on the menu and immediately had to call the waitress back. Even this photo doesn’t do it justice. It’s the ‘Ultimate Hot Chocolate’ (£4) and it is huge. It’s listed under the Drinks section, which is totally misleading. This, dear friends, is a meal in (and around) a mug. 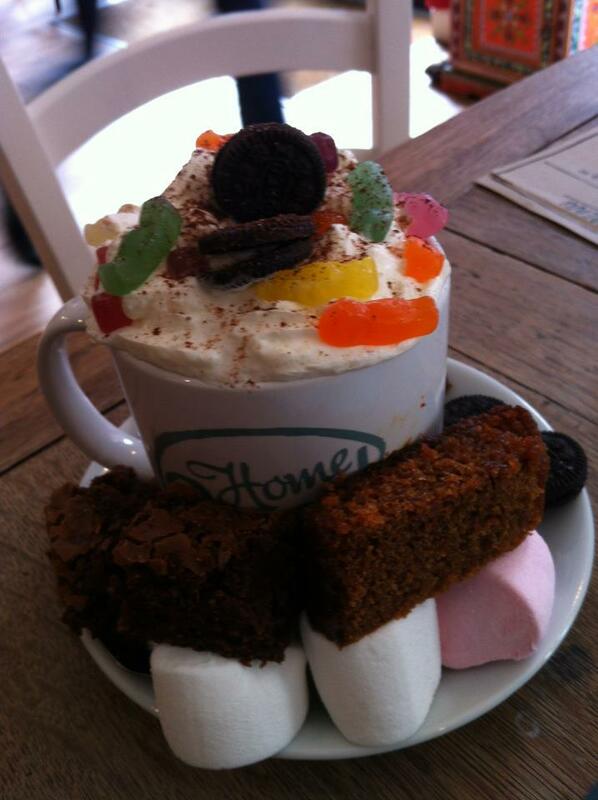 There’s Hershey’s hot chocolate under there somewhere, covered in whipped cream and adorned with jelly babies, mashmallows, mini Oreos, homemade ginger cake and homemade brownies. Wow. It was so good, and so filling. Service was pretty leisurely so by the time we came around to ordering food (yes, I am sticking by HSH’s analysis of the above as a ‘drink’) I was beginning to digest the aforementioned mound of sweetness. The whole reason we’d chosen HSH was because I’d been envious of Lucy’s previous trip there to enjoy their waffles so there was no way I was leaving without ordering the Breakfast Waffles (£5.50). 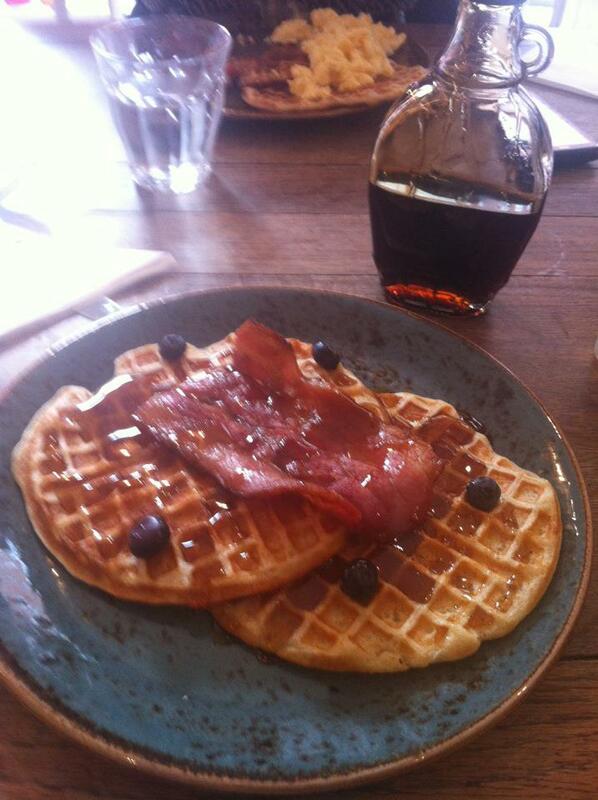 I told them to hold off on the poached egg – that would’ve been one step too far, plus y’know I do hate the things – but the beautifully thin (Thank the Lord) waffles arrived speckled with a few blueberries and a slab of perfectly cooked streaky bacon. And the best thing? They give you maple syrup to pour yourself. I’m a big advocate of this as it annoys me to no end when places advertise pancakes/waffles with maple syrup which they’ve pre-poured for you (*cough* I’m looking at you Trof *cough*). They were delightful and you know what? I ate every last crumb. So with the exception of a few stray semi-melted jelly babies and the ginger cake which Lucy devoured, I managed to polish everything off. It took two glasses of tap water to wash it all down but for £10 (including a meagre but student budget appropriate tip) I can safely say I’ll be full for a few more hours yet. If you haven’t been: Go! Just wear loose fitting clothes and be prepared to write off the rest of your day. Then again, you could just eat a normal amount of food. That would also work. Home Sweet Home is on Edge Street in the Northern Quarter, Manchester. They also serve lunch and dinner which I’ll definitely be heading back to try.